This is one case where being on your phone mid-match might not get you in trouble with the refs. Amazon is hosting the Mobile Masters Invitational in Newark, and through today and tomorrow, teams will compete in several different competitive mobile games. Competitors use mobile devices, either phones or tablets, rather than controller or mouse-and-keyboard inputs. Starting with Vainglory, the mobile MOBA, it’s a very different esports event than you might be used to watching. Despite the format, Vainglory is still very much a MOBA. There’s a lane, turrets, minions walking mindlessly to their doom and plenty of teamfighting. It’s pretty interesting to watch if you come from a PC MOBA background. Many professional organizations have Vainglory rosters as well. Tempo Storm is in attendance, as are NRG, ROX Armada and Cloud 9, who all field multiple rosters in other esports. Though Summoners War caps off the event tomorrow, a traditionally PC game—Hearthstone—will have pros in attendance this afternoon. It will be interesting to see if the change in inputs will have any affect on them. I know I’ve fireballed myself a few times playing Hearthstone on a touchscreen. The mobile setup can lead to some concerning ergonomics. 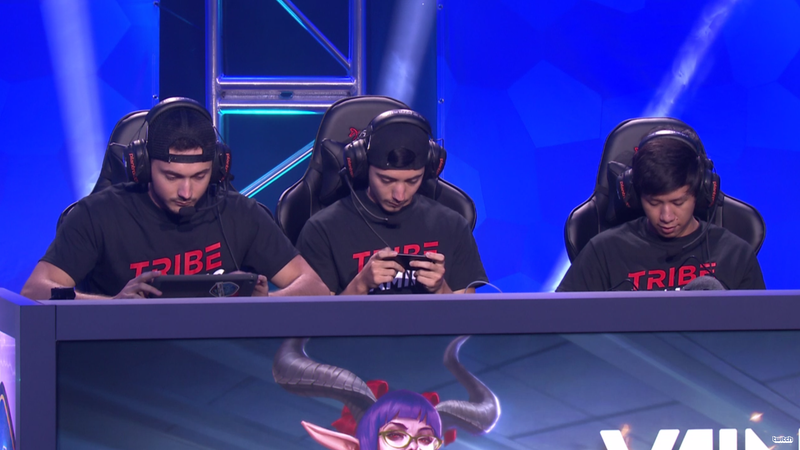 While most players at competitive events are looking ahead at a screen, these players are hunched over a phone or tablet. Some have their device on the table or in their lap, and a few keep pulling the phone close to their face to make things out. I can’t imagine that feels great for your neck or back. You can follow the mobile mayhem throughout today as Vainglory wraps up and Hearthstone starts, and tune in tomorrow at 1 p.m. ET for the Summoners War competition on Amazon’s Twitch channel.